The wind chimes evoke the tone of the bells in some of America's historic harbors. 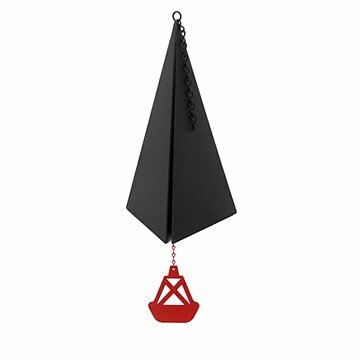 These rugged wind chimes echo the distinctive and familiar tones of buoys' bells®, ringing out the comfort of home no matter the weather. Specifically evoking the tone of the bells in Maine's Bar Harbor, Boston Harbor, the Outer Banks or San Francisco Bay, these chimes capture the majesty of nature in unique settings. Each powder-coated wind chime is made of 60% recycled steel and created in an eco-friendly process. Designed and handmade by the Davidson family of Maine, each bell has a "living finish" that will patina over time. Click each of the following names to hear its sound: Bar Harbor Bell, San Francisco Bay Bell, Boston Harbor Bell, Outer Banks Bell. This is a family story, begun by Jim and May Davidson on the craggy Maine Coast. In the small town of Round Pond they, their family and their neighbors craft wind bells that echo the distinctive and familiar tones of coastal and harbor bells. He began recording the sounds of bell and gong buoys where he hauled lobster traps, and then eagerly sought other bells in the region. After hours of listening to these tapes and painstakingly working pieces of steel to match the tones, he produced his first set of bells that recall the haunting, yet comforting sounds Jim experienced while working along the New England Coast. Each bell is based on Jim's interpretation of the gong and bell buoys in the areas for which they're named. Because of the wide variance in their tones, his groupings have resulted in single, double and triple-toned bells. Each is reminiscent of the magic he experienced on the water. As time has passed, Jim and May's children, Connie and Paul, have gone on to create additional bells. In 2009 we purchased our bell, and it is still just as sturdy and sounds just as great as the day it was delivered! I'm a stroke survivor, and the sound of our Bar Harbor Buoy Bell is soothing and creates a stress-free zone for me! I purchased the Outer Banks bell and am delighted with the tone. Hanging in my garden its' resonance brings back fond memories of traveling between the islands of the Outer Banks. It is well made and should last many years. I love the deeper tones of this chime. Most chimes are a bit too tinkly. With this one, I can bring the cost with me wherever I live! Wonderful sound! Very relaxing! Made a great gift ! Thrilling gift- brought back memories of Maine. PERFECT CHIME FOR ANY HOME! GREAT HOUSE WARMING GIFT! THIS BOUY BELL/CHIME IS EXACTLY AS SELLER DEPICTS! I AM VERY PLEASED WITH THE TONE, THE LOOK AND THE QUAILTY! I AM PLANNING AHEAD AND THINKING OF WAYS TO GIFT THESE BOUY BELL/CHIMES TO FRIENDS. I'M TINKING HOUSE WARMING GIFTS! this was given as a gift and they loved it. Great gift for folks who have everything. This was a gift for a couple who just bought a new home. It will remind them of our friendship and joy in this new chapter of their life. I'm using the Bar Harbor buoy bell at my mother's memorial, as she was born in Vinalhaven, MA. and I want to remember her when I hear the wind chime clang, like off the ocean. If the wind blows too hard, and the bell gets too loud, the clapper inside can be "hushed", and made silent, so as not to disturb the neighbors and sleeping children. I can hardly wait for the wind to stir it, and bring back long lost memories being close to the sea....and my mom's memory.